History buffs: With one click, see a timeline of every county, state and country the spot where you're standing has ever been a part of. Now, find the check box just below the map, and click it. Sit back and travel back in time through every county, state, territory and country your red marker location ( ) has been a part of! 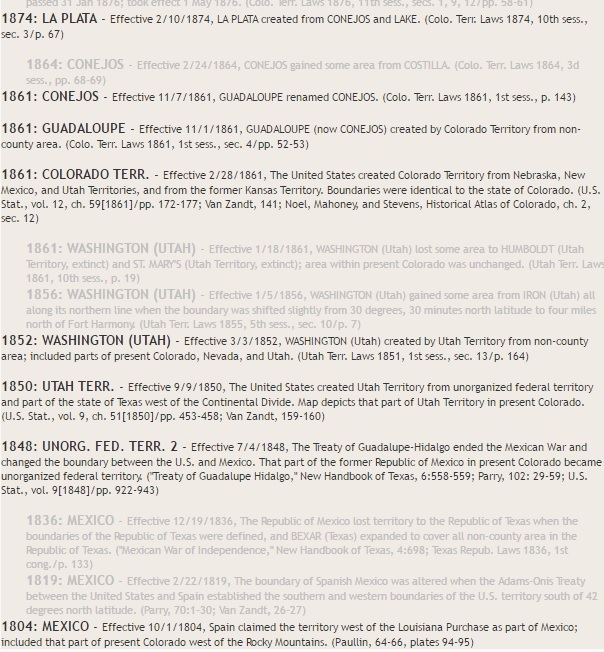 See the example below showing Durango, Colorado -- part of La Plata County, Colorado today -- all the way back to when it was part of Mexico in 1804! NEW: You can also set the update interval that controls how quickly the map and list changes as you go back in time. On a practical note, if you do historical or genealogy research, it's important to know what county your place of interest was part of as of a given point in time. For example, if your location was part of a different county than what it is present day, that other county courthouse just may have the record you're looking for. 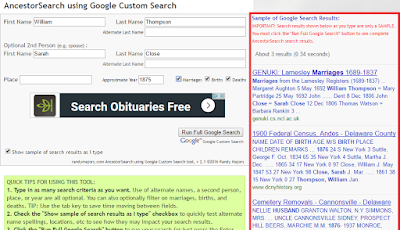 With the popularity of my AncestorSearch using Google Custom Search tool (over 90,000 hits and climbing), I was overdue in making some enhancements suggested by users of the tool. The two key enhancements are highlighted in the screenshot below. 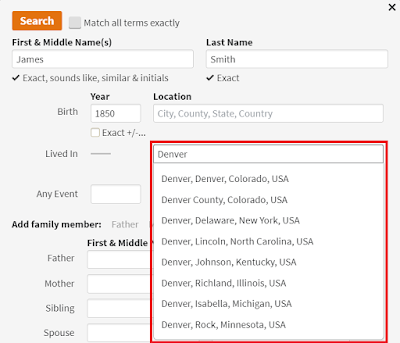 First, you can now filter on Marriages, Births and Deaths (or all three!) by checking the corresponding boxes. Second, you can get a preview sample of your search results as you type by checking the "Show sample of search results as I type" checkbox. This is useful if you want to quickly test alternate name spellings, locations, etc to see how they may impact your search results. When you do that, the sample of results appear as shown below. IMPORTANT: Search results that appear on the right (above) as you type are only a SAMPLE. 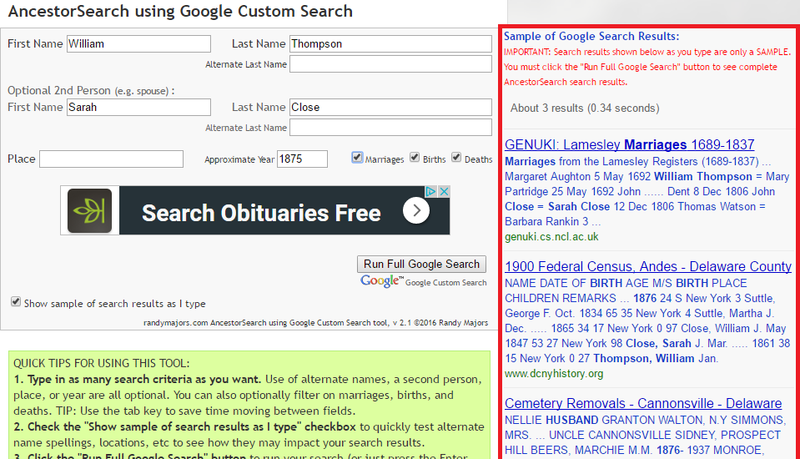 You must click the "Run Full Google Search" button to see complete AncestorSearch search results. Finally, I've also made some performance improvements which should make the tool a bit quicker and more responsive to use. - Type in as many search criteria as you want. Use of alternate names, a second person, place, or year are all optional. 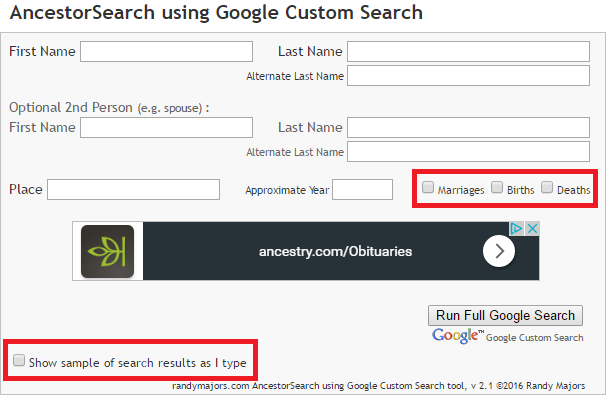 - You can also optionally filter on marriages, births, and deaths. - Check the "Show sample of search results as I type" checkbox to quickly test alternate name spellings, locations, etc to see how they may impact your search results. - Click the "Run Full Google Search" button to run your search. Search results appear in a new tab; close that new tab to come back and refine your search. - Save time by using shortcut keys: Use the Tab key to move to the next field, and press the Enter key to run the full search. - PRO-TIP: After clicking the "Run Full Google Search" button, you can edit the search string on the Google Search page that appears (this is useful for adding other Google advanced search strings to your search, such as excluding pages that contain certain words by using the "-" (minus) sign). I hope these enhancements make the tool more useful for you, and as always I welcome your suggestions and ideas in the Comments section below.